Sometimes work life and personal life collides and something awesome happens. In this case, it was helping my Modern Quilt Guild break out of its rut and plan for the New Year! But first, let’s a little background! Work Life: One of my key roles with the SAMHSA SOAR Technical Assistance Center (SOAR stands for SSI/SSDI Outreach, Access, and Recovery) is to facilitate community action plans around issues of homelessness, housing, and access to mainstream benefits. The work we do with communities is effective, and the type of action plans we create allow community members to have a say and feel like they are contributing toward the overall goal! Personal Life: I am an avid quilter! You can read more about how I got into quilting and the inspiration behind it in one of my previous blog posts. A little over a year ago, a group of us came together and formed the Capital District Modern Quilt Guild (CDMQG). The guild is a chapter of the national Modern Quilt Guild (MQG). MQG is widely known in the modern and indie quilting community; its website is full of patterns, tutorials, webinars, and ways to connect with other quilters. Each year MQG also puts on QuiltCon, which is a worldwide quilt show, event, retreat, and conference for modern quilters. Am I going to this year’s QuiltCon? The answer is YES, and I cannot wait! 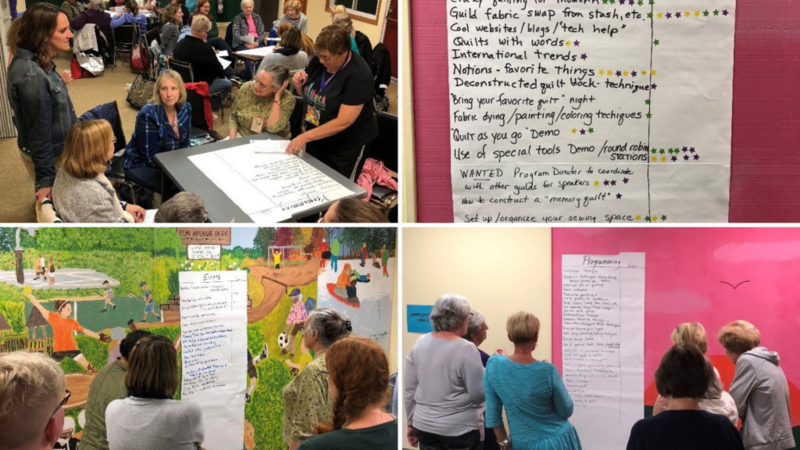 Many of my quilting friends (also known as Quilty Ladies) are familiar with the work I do, and one Wednesday night while sewing (we sew every Wednesday night at our local quilt shop), they asked if I would be interested in creating an action plan with the CDMQG. Recently the group had found themselves in a rut; programming and speakers were becoming harder to find and the group was really craving new ideas! Projects—guild or charity project ideas. Each group was given approximately 10 minutes with each area, and I told them to write down any and all ideas they had for that specific area. By the end of the 30 minutes, multiple sheets of flip chart papers were full of ideas! The great thing about this process is that the ideas are anonymous (yes the people in your group know who proposed the idea, but names are not assigned). Once all the ideas were down, I instructed each member of the guild to rank their top three ideas for each of the three areas. What resulted was a clear direction for programming, events, and projects. We came away with so many ideas for the New Year! The following meeting we reviewed the action plan, assigned lead people and time frames, and we were off to the races! The members of the CDMQG are so excited for the New Year and all the ideas that were generated from the action planning session. For me, it was a great way to share my facilitation skills, help my group bust out of its rut, and for maybe the first time, apply action planning principles to quilting!